RIO DE JANEIRO: Last Sunday night the prime-time television show, "Fantástico," an institution in Brazil, aired a report on soccer star Neymar. It consisted of documentary footage of the FC Barcelona forward in which he posed for cellphone photos with fans, flew on planes, had his injured foot massaged and competed in a go-kart race with friends. Less than two weeks before the tournament kicks off with Brazil's match against Croatia in Sao Paulo, interest is intense in anything concerning the young striker expected to win the World Cup for the host country. Even go-kart races. "He won the race, burst open the champagne, and went to the top of the podium. And did anybody imagine anywhere else for him?" gushed the voice-over. The Brazilian national team's most talented player does not have to turn up to TV studios any more. TV comes to him. For his May 25 appearance on the variety show "Faustão's Big Sunday," he was interviewed via video link from his sofa, surrounded by a dozen close friends, bouncing his son David on his knee. The studio audience rose to its feet and chanted his name as host Faustão praised "the big hope for the Cup." Right now, Neymar can do what he wants. But Brazil has expectations — a record sixth World Cup title — and he will have to deliver. If Brazil loses what is already the least popular and most controversial World Cup in recent memory, many fear more of the mass street protests that blighted last year's Confederations Cup, a tournament that acts as a dress rehearsal for the World Cup host. Simmering under this is the collective trauma lingering from the last time Brazil hosted the World Cup, when it suffered a shocking defeat to Uruguay in the 1950 final at Rio's Maracana stadium. "If Brazil lose, I think we will have a disaster similar to that in 1950," former president Luiz Inácio Lula da Silva said in a recent interview with Carta Capital, a Brazilian magazine. "I fear tremendous frustration, and we don't know the psychological result for the people." When Brazil last won the World Cup, in 2002, the team featured two previous winners of FIFA's world player of the year award — Ronaldo and Rivaldo — and one future winner, Ronaldinho. This year's team has none. Commentators described Neymar as the team's real craque, meaning ace or genius. "He is the most important player of the team. There is a very big hope that he will be the great craque of Brazil and the Cup," said Eduardo de Andrade, known in Brazil as Tostão, a member of Brazil's 1970 World Cup champions and a celebrated soccer columnist. Juca Kfouri, another of Brazil's best-known newspaper and radio columnists, voiced the fear of many when asked what Brazil would do if Neymar was injured. "Pray," he said with a nervous laugh. That is a lot of weight on the shoulders of a 22-year-old playing in his first World Cup. "He is about to enter a level of pressure which is entirely new to him," said Tim Vickery, a South American soccer correspondent for the BBC and an ESPN columnist. "Pressure exists for all players," Neymar said in an interview last year. "Before the game there is always that anxiety, butterflies in the stomach. After the game starts, it ends." Born Neymar da Silva Santos Jr., his parents Neymar Sr. and Nadine realized their son's potential when he was just 6 or 7, his father said in 2011. "The talent was together with the passion he has to play football," he said of his son. Neymar Sr. was a former player who had battled it out in the lower leagues. He showered his son with love, attention — and toy soccer balls. Today he is his son's manager. The younger Neymar began his career with the Brazilian club Santos, where the great Pele made his name. He started with the club at 11, signed a professional contract at 16 and rapidly became a national hero, scoring as Santos won the Copa Libertadores — the South American club championship — in 2011. He scored 138 goals for Santos before moving to FC Barcelona in 2013 for a transfer fee that cost the Spanish giant $77.6 million. Neymar's parents' company received more than $54 million in the deal. 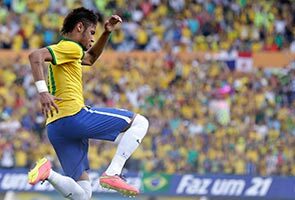 Neymar is a phenomenal soccer player, as he most recently displayed with a goal and two assists in a 4-0 exhibition victory over Panama on Tuesday in Goiania, Brazil. "He is the player with most talent, with most repertoire, most skilful, most creative," Tostao said. He is versatile. His play is rapid, fluid, yet unpredictable. His shots come high or low or armed with a vicious curve, and he is as good with his left foot as his right as he is with his head. He loves to dribble around defenders with an array of feints and tricks and has a goal-scorer's killer intuition. "It's the instinct of the attacker," he said in a 2011 interview. "He has to be very smart, really connected to the game to score." At Santos, he attacked from the left wing — his preferred position, although Barcelona has played him on the right. Brazil Coach Felipe Scolari is likely to keep him left in a line of three, with Oscar and Hulk, behind the team's center forward Fred. This, said Vickery, is the system under which Neymar performs best. Tostão said Neymar is most dangerous when he has space to run at a defense. "He is more spectacular when Brazil play and counterattack," he said. This was how Brazil played in the Confederations Cup, where Neymar scored four goals in five games, including a spectacular shot in a 3-0 defeat of defending world champion Spain in the tournament final. He scored 17 goals in his first season at Barcelona, alongside the Argentine great Lionel Messi, but that team, not long ago described as one of the greatest of all time, was knocked out of this year's Champions League quarterfinals by Atletico Madrid. Even in that decisive 1-0 loss on April 9, Neymar's showed his flair, embarrassing a defender with a daring "nutmeg," in which a player dribbles the ball between an opponent's legs. Good-looking, with an easy, boy-next-door charm and a personal style that is both colorful and in line with that found in malls across Brazil, he is a heartthrob for teenage girls and an icon for boys. In 2011, he said his idol was David Beckham, who parlayed his soccer career and good looks into global fame. "We try to follow the same steps," he said. Beckham increased his fame and earning power considerably after he married Victoria Adams, a former member of pop group the Spice Girls, forming a powerful celebrity couple known as "Brand Beckham." Neymar has recently rekindled his romance with Bruna Marquezine, 18, a Brazilian soap opera star and something of a national sweetheart. Brazil's troubled World Cup, with its late, overbudget stadiums and unfinished transport works, needs a hero like Neymar. But it wasn't just FIFA that came under heavy attack during the 2013 protests, in which demonstrators demanded "FIFA standard" health care and education. Some protestors carried placards insisting a teacher was worth more than Neymar's salary — he will earn more than $75 million over his five-year contract with Barcelona, not including his myriad sponsorship deals. Even Ronaldo, a member of the World Cup organizing committee, said recently that he was ashamed of Brazil's late, chaotic and badly organized preparations. "I am embarrassed, this is my country and I love it and we shouldn't be transmitting this image abroad," he told Reuters. Romario, a member of Brazil's 1994 World Cup-winning team and now an outspoken congressman, has criticized World Cup spending. "We've already lost off the pitch," Romario recently told UOL, a Brazilian news website. "Now we have to hope and pray that we do well on it." If the Cup was held in Europe, said Kfouri, he would pick Germany to win. "But having the Cup here, and with the performance that the team and Neymar had in the Confederations Cup, I think Brazil is the favorite," he said.